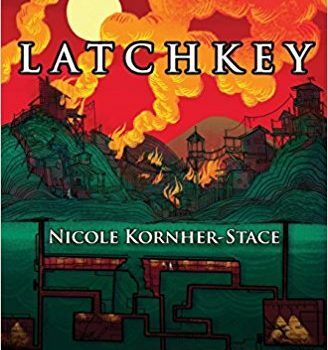 Latchkey, Nicole Kornher-Stace (Mythic De­lirium 978-0-9889124-8- 9, $17.95, 336pp, tp) July 2018. Cover by Jacquelin de Leon. 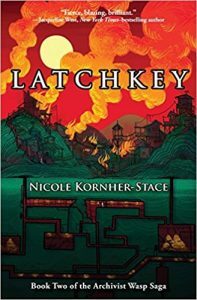 Latchkey is the sequel to Nicole Kornher-Stace’s poorly known (and sorely under­rated) Archivist Wasp. 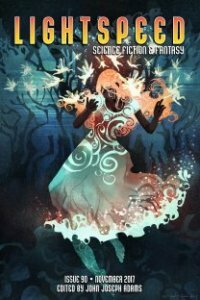 Archivist Wasp, published in 2015 by Big Mouth House, was a genre-straddling story: part post-apocalyptic coming-of-age tale and part fantasy quest, it structured itself as a literal katabasis – a descent to the underworld – in which a young woman, the eponymous Wasp, follows a nameless ghost, who’s bargained for her help, into the ghostlands to seek the lost ghost of an old comrade. These ghosts were alive before the old world fell, and remember the world in the Before-time, before it became the post-apocalyptic landscape that it now is. Wasp, having escaped a brutal life under the thrall of the Catchkeep-priest – only to be trapped on a mountain where she’s likely to die of exposure – has little left to lose. Latchkey opens several years after the end of Archivist Wasp. Wasp, now known as Isabel, is the leader of a small group of young women, the former adolescent girl acolytes who once fought and died to become Archivist under the eyes of the Catchkeep-priest. Isabel overthrew the Catchkeep-priest, and is struggling to build a place for her former rivals in their small com­munity of Sweetwater – whose inhabitants bear them uneasy respect. 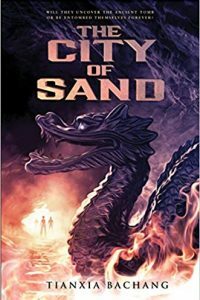 When deadly raiders from across the Wastes threaten Sweetwater, Isabel finds that she hasn’t put her sojourn in the un­derworld entirely behind her. In forgotten tunnels below Sweetwater, she finds herself once more face to face with her nameless ghost former ally – a supersoldier from the Before-time – and his fellow-supersoldier comrade ghost Catherine Foster. Struggling to return to Sweetwater in order to help protect it, Isabel finds herself trying to unravel the secrets hidden in those tunnels – the secrets of the experimental programme that created Foster and the soldier. The ghosts of the subjects of the Latchkey Project still linger in the tunnels, and some of them are both powerful and mostly mad. It doesn’t help that Isabel isn’t entirely sure about the motives of her nameless soldier ghost ally, or Catherine Foster’s either. Nor does it help that Catherine Foster doesn’t remember anything of her living existence – even the scraps that the nameless soldier recalls after hundreds of years as a ghost. Part of Isabel’s struggle in Latchkey is in trying to find a way to restore the memories of the ghosts that have become, one way or another, her friends – in part because she cares, and in part because ghosts, especially ghosts with neither memory nor self-control, are extremely danger­ous. And Foster, while she has self-control, is an enormously powerful ghost. 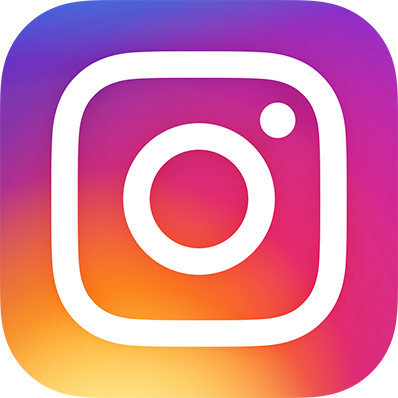 Latchkey is another katabatic narrative, a literal descent and re-emergence that in this case parallels metaphoric ones. Isabel must contend with her own doubts and fears, weaknesses and uncertainties, in the tunnels below Sweetwater – and she must contend, too, with the complications presented by Foster, the nameless soldier, and their history together. Kornher-Stace has a deft touch with voice and character. Isabel is immensely compelling: a young woman raised in a brutal environment with little affection, who expected to die in ritual combat, and who nonetheless manages to develop personal integrity, ethics, compassion, and the ability to care about other people. 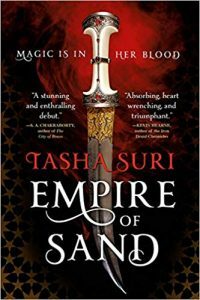 She’s grown into a role as a reluctant leader, albeit one scarred by her experiences, and her friendship with Sairy, her second, is a touching and complicated thing – as is her relationship with the nameless soldier. Latchkey‘s prose is elegantly self-effacing: smooth, easy to read, and full of adroit turns of phrase. Kornher-Stace has a gift for creat­ing atmosphere, from the familial closeness of Isabel’s small community of former upstarts in the Catchkeep-temple, to the ominous claustro­phobia of the tunnels beneath Sweetwater, and into the hectic chaos and turmoil of battle. And underwriting every moment is a core of kindness, of compassion – of choosing a path away from cruelty, even when it’s hard: a core that makes this book, for all its darkness, somehow funda­mentally uplifting. 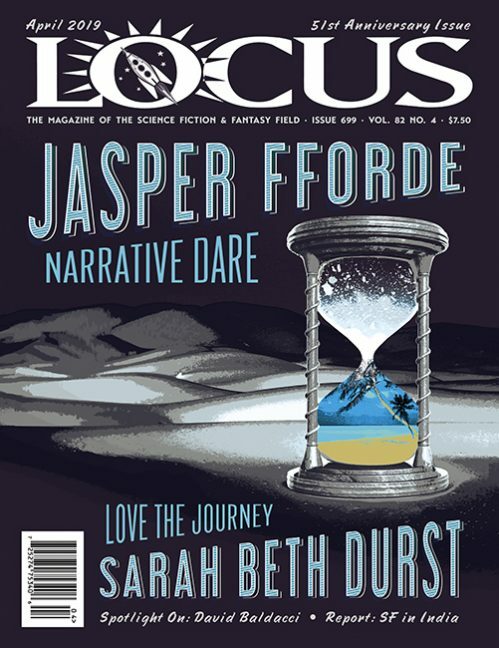 If I had to choose one word to describe this novel, it would be compelling: in its pacing, its characterisation, and even in its genre-blending approach to worldbuilding, it compels attention. I really enjoyed Latchkey. I can’t rec­ommend it, and Archivist Wasp, highly enough. I loved Archivist Wasp, and am extremely excited to see that there’s a sequel!